What Makes Desert Festival So Addictive That You Never Want To Miss One? Rajasthan is a synonym of fares and festivals and one of the most famous festivals is Desert Festival. Rajasthan Government organize this event every year in Jaisalmer in the month of Magh (Hindu Month), 3 days before the full moon. 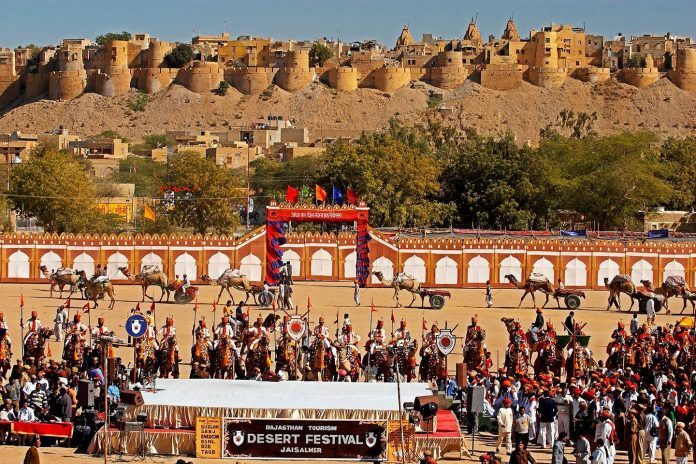 The festival is celebrated in the beautiful Thar Desert, Sam Dunes which is 42 km from the Jaisalmer. The location is a most beautiful location in the Jaisalmer seems like heaven. Every Indian festival has an interesting story behind it and same in the case of the Desert Festival. Very few people aware of the fact, why people celebrate it. Lord Krishna of Yadav community told Arjuna that an inheritor of Yadav community will devise the kingdom on the Trikuta Hill. The prediction came true in 1196 when Rawal Jaisawal, an heir of Yadav community set up his kingdom in Jaisalmer. As a result of the right prediction celebrations were made in Jaisalmer. Those celebrations turned into the name of festival which is Desert Festival today. The Government is also making its efforts to make the festival famous in the whole world. Probably it is the biggest festival of the Rajasthan. 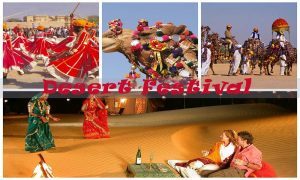 Rajasthani people celebrate Desert Festival with full joy and enthusiasm. Localities wear traditional and colorful costumes which make them a traditional Rajasthani. They sing and dance with full happiness. The Gair and fire dance, folk music gave pleasure to one’s soul. Apart from these, there are many attractions like Camel polo. Camel races. Gymnastic stunts. Turban tying and Mr. Desert competition are the main attractions of the festival. The last day of the festival is Grand Finale which is on the Full Moon day and it ends with Rajasthani Folk concerts. Delicious foods, handicrafts, Desert safari, Camping are the other attractions of the festival. Jodhpur airport is the nearest to the Jaisalmer. It is 337 km away from Jaisalmer. You can hire a taxi to reach there from this International Airport. Jaisalmer have a huge train network which connects it with all well-known cities of India. So reaching there by train is very easy. Indian cities have a very good road network and Jaisalmer is one of them. You will find many government and private buses to reach there. You can book private coaches with AC or NonAC.